Suddenly, I’m wide awake to the sounds of crashing thunder and pelting rain. 5.30am according to the bedside clock. A quick look out through the blinds reveals total darkness, not even a glimmer from the street lights. I thought, oh no, not another electrical blackout for the lights and another day confined inside the house, no views, just pelting rain and a feeling of descending gloom for me. 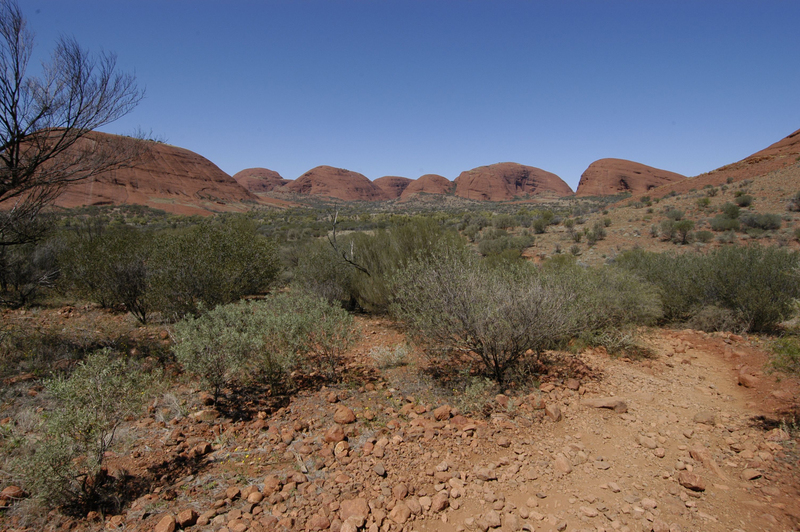 Still half asleep, and without warning, I felt myself being transported, as if by magic, to the wonderful rounded red granite domes of Kata Tjuta National Park in the centre of Australia where it seldom rains, the sun always shines and the silence can be deafening. 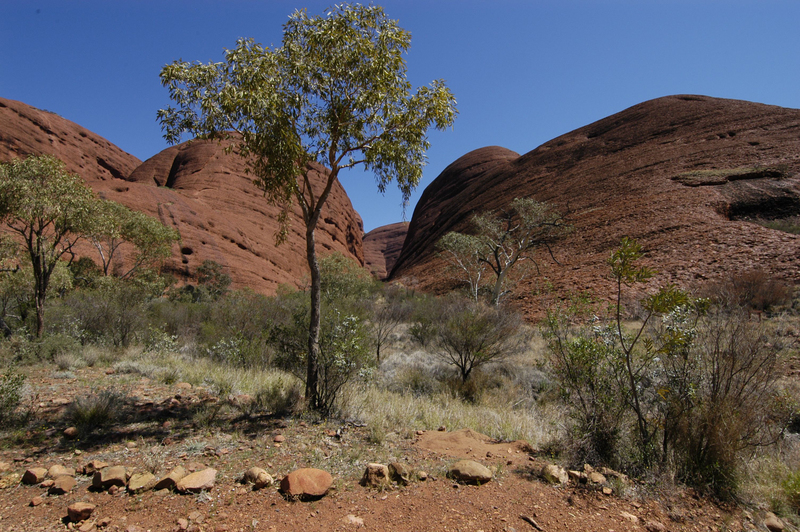 Kata Tjuta, or The Olgas, as it used to be called by white Australians is the spiritual home of the Anangu people. I’ve been there many time before, experienced the mystery of its hidden valleys, changing light and cool shadows thrown by the rock walls and occasional trees. I’m not in the least surprised by this morning’s sudden transport of my imagination to Kata Tjuta. Once there I’m not constrained by the pressures of daily existence. My mind can roam free of constraints. My imagination can run riot. Aboriginal people call it ‘The Dreaming’. Now, I’m nestled in my favourite space between two massive domes, looking down The Valley of the Winds. I can hear the rustle of the trees, the warble of the birds and feel the gentle rays of the Autumn sun warming my body. My body is totally relaxed and I feel as if I’m floating just above the ground. No tensions in mind or body, and I totally embrace the feeling. Now, my thoughts gradually return, but not of accounts, obligations, responsibilities and desires. No, just soft pastel colours, pleasing sounds, gentle aromas and loving memories of people and places fill my thoughts. How lucky am I to be transported in my mind to Kata Tjuta. 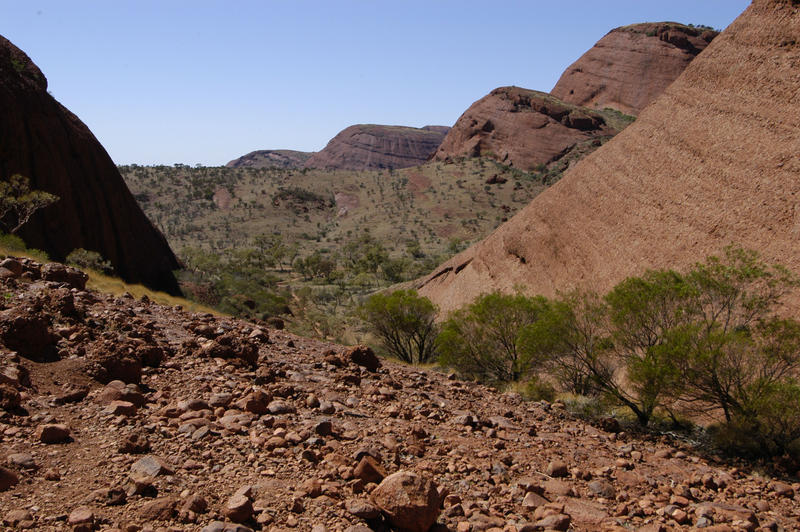 I give thanks to a long departed Pitjantjatjara friend who brought me to this Special Place and taught me all he could without breaking any traditional lore. After what seems like an eternity, I’m suddenly conscious of the alarm clock. My blissful dreaming is no more. Reality strikes, I am again in a room and yes, it does have a view, a mystical imaginary one into which I can escape should the need arise. Facing reality is a necessity. I peer through the blinds, the rain is still tumbling down. This time I’m thankful as the rain is needed by the local farmers, for me, it settles the dust from nearby residential development, washes debris from our local river and refreshes everything. Thank you Kata Tjuta for once again letting me realise that my city life is good. That I can relish the knowledge given me by my old Pitjantjatjara mate about the 36 giant domes and why he was unable to take me to other places within the domes as he himself could not go there. Yes indeed, I’m looking forward to my next existential trip,knowing all the while that I’ll be back to my own room with a view. In the meantime, you can dream of being at magical Kata Tjuta, just allow yourself to float through these four images. 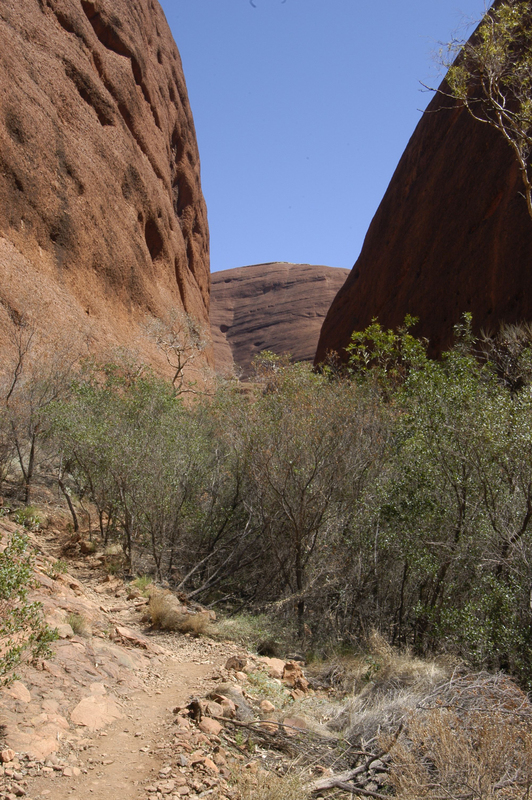 LOOKING INTO KATA TJUTA – A MAGICAL PLACE FOR DREAMING. GETTING CLOSER TO THE DESCENT INTO THE VALLEY. THE WALLS SEEM TO CLOSE IN AS IF TO KEEP ALL EVIL OUT. NEAR MY FAVOURITE ‘DREAMING’ PLACE IN KATA TJUTA.